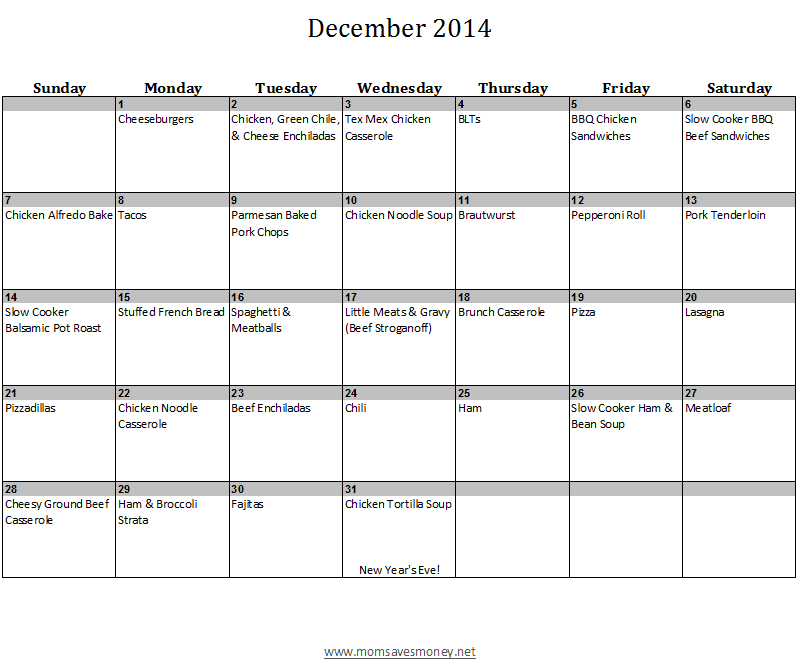 December Monthly Meal Plan with Calendar & Recipes! Looking for more than just a weekly menu plan? Try this MONTHLY menu plan! I’ve put together a plan for this month based upon common meals that we have at my house. What if I want to see the Excel version? Awesome! You can download it here. Awesome! Here are the links for the recipe that I usually use. What if I want to plan for more than just dinner? Awesome! Feel free to print this out, write out breakfast & lunch meals. Or you can edit it in Excel and make it your own! Awesome! Use which ever recipe you normally use and just use this basic plan as a suggestion. I tried to have a variety of meals each week – some beef, some chicken, some pasta, some soups. That way you won’t get too bored. But there are also plenty of ways to save time when using this menu plan. Examples: When prepping chicken at the beginning of the month, make enough for the other recipes and freeze it for future use. When making ground beef, brown 2-3 times the normal amount and freeze that. It makes it super quick to pull meals together! Thank you for sharing my Slow Cooker Lasagna! I’m excited to share your menu plan with my Facebook fans! Great ideas! Thanks for sharing and so glad your 2 year old likes it too!